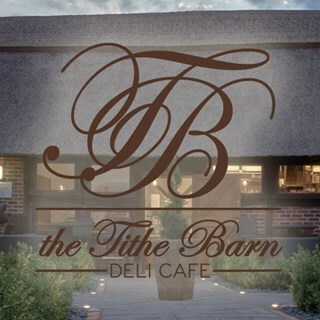 Tithe Barn Deli Café located in the South Leicestershire village of Cosby, stocks an outstanding range of quality food and drink including artisan breads and pastries, cold meats, delicious preserves and sauces, select cheeses and dairy produce. There is indoor seating for up to 30 people, while the extensive courtyard garden can seat up to approximately 50 people. Customers can order take-a-way from the deli counter or choose to dine in or within the courtyard garden with menus available for breakfast, lunch and early supper. Booked to come here last Saturday. Not ale to book a table outside which was a real disappointment and something i don't feel is necessary. The waiters/servers were great, food was excellent. The setting is fantastic. It was very busy so the food took 45 minutes to arrive but tasted great. Thank you for taking the time to review your visit at Tithe Barn. As a Company policy we can only reserve tables inside. Once those customers arrive and wish to dine outside, they can do so but their table inside will then be put on hold. This is down to the British weather, if it takes a turn for the worse, those customers can then be accommodated back inside the Barn. The current weather conditions mean lots of customers wish to dine in the Courtyard. We have no control on the number of walk ins on each day. We apologise that you had to wait for a longer period than usual for your food but delighted to hear you enjoyed your meal. For a first time it was a little disappointing as my first food choices were not available. The service was a little slapdash and slow. Thank you for taking the time to add a review of your recent visit to Tithe Barn. We apologise that we failed to impress you on your first visit. The current weather conditions are proving Tithe Barn to be a popular location to come and dine, thus adding a higher turnaround on food. We apologise that your choice of dish was not available on this occasion. We hope this hasn't put you off returning in the future as we strive to offer an exceptional customer service to our guests and welcome all constructive criticism in an effort to maintain and improve this level. Very busy so staff were stretched. Really enjoyed our experience. The current weather conditions are proving Tithe Barn to be a popular venue to meet and dine. Thank you for your understanding and we hope to see you again in the near future. Great cafe - service and food excellent. Outdoor seating a bonus. Thank you Maggie for the positive review. We look forward to seeing you again in the near future. I came as a belated birthday lunch for my mum, I has both of my 3 young sons with me (one of which was not in a good mood) the staff were so lovely and saw we were having a bit of a struggle with him and they tried to help keep him busy with colouring and talking to him when they came to the table or had a free minute, so it didn't seem to be any trouble for them at all. The food was lovely and we will definitely be returning soon, hopefully with a happier little boy. Thank you for the positive review. We look forward to seeing you and your little boy again in the near future. Lovely breakfast but service a little slow and item requested to be swopped on breakfast was swopped with a different item. Thank you for taking the time to review your visit to Tithe Barn. I am very disappointed to hear that you had to wait longer than necessary for your breakfast. We take complaints very seriously and we are currently working on the areas that need improvement across all departments. We have recently undergone a number of staff changes including kitchen, waiting staff and chefs. Please be rest assured that all new members of the team are receiving training and we hope to bring our level of service back up to where it should be and what you deserve. What has happend?! It's a good job that my last visit wasn't my first so that I knew Tithe could be so much better. Having been several times in the past, I booked us in to celebrate a family members birthday. We were really looking forward to it as have always had lovely food here. Unfortunately on this visit our food never came! We waited over an hour. A member of staff came to apologise and said he would be chasing up if order. A few minutes passed and I was then told that part of my dish wasnt available. Surely I could have been told this sooner? However, we were hungry and as I said I knew the food could be good, so I accepted an alternative. 10 or so more minutes pass only for the completely wrong food to be brought out. A member of staff (who didn't take out order) then had the nerve to say that it was what we ordered. By this point of had enough. My 2 n and half year old had waited very patiently all this time, but seeing as it looked like she wasn't going to get her lunch anytime soon we left. Its baf enough yo keep us eaiying, but to keep her waitibg that long was awful.1 and a half hours after our table was booked for, we left having no food and no desire to hurry back any time soon . How disappointing that what was a lovely place, had such awful service. We weren't the only people there that day who felt the same. Carry on with that level of service and I can't see you being around much longer. Such a shame. ( Only given 2 stars in some areas as I know we have enjoyed our visits in the past) If our last visit was out first there would be no stars given. We are immensely sorry for the disappointing experience and service you received here on the 17th June 2018 on what was supposed to be an enjoyable lunch, to have to wait so long for your meal was indeed unreasonable and we appreciate your feedback. We take feedback very seriously and are currently working on the areas that need improvement across all departments  to bring the level of service back to where it should be and what you deserve with more staff training. We have currently undergone some staff changes in our kitchen and have had a few new chefs, please be reassured we will make sure this doesn’t happen again. We had the Pizza and Pasta with unlimited prosecco and peroni deal and it was absolutely lovely! Sat in the gorgeous court yard, lovely food and drinks and superb service. We will be back! Thank you so much! An oasis  of enjoyment to be shared by everyone. Lovely polite helpful staff, wonderful atmosphere and fantastic food. Will definitely be booking again in the near future. Kind Regards Sarah from North Warwickshire. Excellent meal, great service couldn't have asked for a better evening! Always love the Tithe Barn, I think it’s one of the best places to eat in Leicestershire. Unfortunately on this visit I was disappointed, while the atmosphere was perfect we did have to wait nearly an hour for our food to arrive and even then parts of my breakfast were undercooked and not up to the usual standard I know and love the Tithe Barn for. However the staff were as usual friendly and attentive but due to some of my favourite dishes being taken off of the breakfast menu and the time we had to wait for the food it left me feeling a little underwhelmed. Thank you for taking the time to give us feedback on your recent visit to The Tithe Barn. We are truly sorry for the underwhelmed experience you received and can not apologies enough. However, we are super happy that the staff were friendly and attentive. We are going through a few staff changes and we are undergoing an extensive staff training plan. Therefore,  we hope you will give us another opportunity to change your opinion from your previous visit. First visit after being recommended - excellent ! Will return soon . Came for lunch on a Saturday, was my first visit to the Barn and can honestly say it was one of the nicest lunches I have had, will definately be coming again and again.